Sarawak captain Rogayah Ali holds the Tun Sharifah Rodziah Cup which was presented by Rosey. MIRI: Sarawak women footballers lifted the Tun Sharifah Rodziah Cup for the first time in the 30-year history of the tournament yesterday afternoon. The historic occasion took place in front of over 4,000 spectators who thronged the Miri Stadium to catch the exciting final between Sarawak and Kedah. Siti Rohani Saptu scored the only goal for Sarawak in the 36th minute of the closely contested match. Sarawak had never advanced beyond the semi-final stage of this premier national women’s football tournament until now. “This win gives a pure and lasting feeling of euphoria to all Sarawakians as apart from being the first time ever to be able to advance to the final, being the host and overall champion brings us an overwhelming feeling of happiness and joy. “The state women’s football team have shown that they are of champion quality and we hope to be able to maintain this team and develop our state women’s football for many other future tournaments,” said Assistant Minister for Youth and Sports Datuk Abdul Karim Rahman Hamzah after the match. “We won’t be rewarding them lavishly but we will know how to express our gratitude to them,” he added. While the team had remained unbeaten throughout the group stage, Sarawak head coach Hakimi Man revealed that he was still stunned by yesterday’s win. “Although we realised that in terms of technical and personal skills our players are still lacking if compared to teams from Peninsular Malaysia, the teamwork and hardwork among our players are important factors that contribute to us winning this competition,” he said. He highlighted goalkeeper Asma Junaidi and the team’s defence as especially crucial. Meanwhile, Football Association of Malaysia (FAM) head of women department Normala Abdul Rashid rated Sarawak as the best state to host the tournament. “The championship organised in Miri has given an impact to the community especially to football enthusiasts and the younger generation throughout the country. “It has encouraged more women to get involved in football and I hope that the other states which will host this championship in years to come will make Sarawak as a perfect example and benchmark as a host state,” she said. On Sarawak’s victory, she commented, “Sarawak sportsmanship and spirit has proven to be really strong over the years. “The courage of the state players is exceptional,” while adding that Sarawak’s win was a surprise. PDRM and Kedah, she said, were expected to be in the final but Sarawak’s sportsmanship and good fighting spirit boosted the home team. Football Association of Sarawak (FAS) president Dato Posa Majais has disclosed that an incentive worth RM30,000 will be given to Sarawak team. “A token worth RM12,000 was also distributed to the team yesterday (April 14) after they won the semi-final against the Royal Malaysia Police (PDRM) team,” he added. 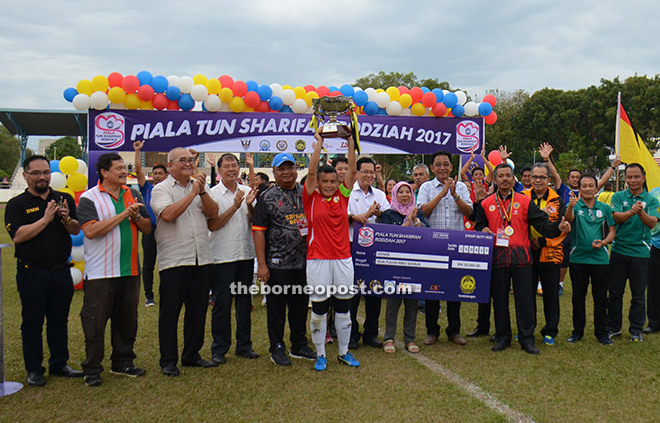 The state players also pocketed the tournament champion’s cash prize of RM20,000 while Kedah and PDRM received RM10,000 and RM5,000 respectively for finishing second and third. The end of the tournament also saw awards given out to Angela Kais of PDRM as top scorer, Asma Junaidi of Sarawak as best goalkeeper, Siti Rohani Saptu of Sarawak as Best Player and the Fair Play Award to the Pahang team. Also present to watch the historic match were Assistant Minister for Solidarity Rosey Yunus, Sibuti MP Ahmad Lai Bujang, Piasau assemblyman Datuk Sebastian Ting, Miri mayor Adam Yii Siew Sang and FAM women’s committee chairlady Dato Nur Huda.